Under-bed storage in the vehicle itself. Slide out drawers with space for a small stove, utensils, spices, etc. We cook a lot rice, pasta, vegetables, etc. We also have a 12V slowcooker. Easy to use, no hassle. Good for frying, grilling, boiling. Seating inside to eat when the weather requires. Portable camp table and chairs otherwise. 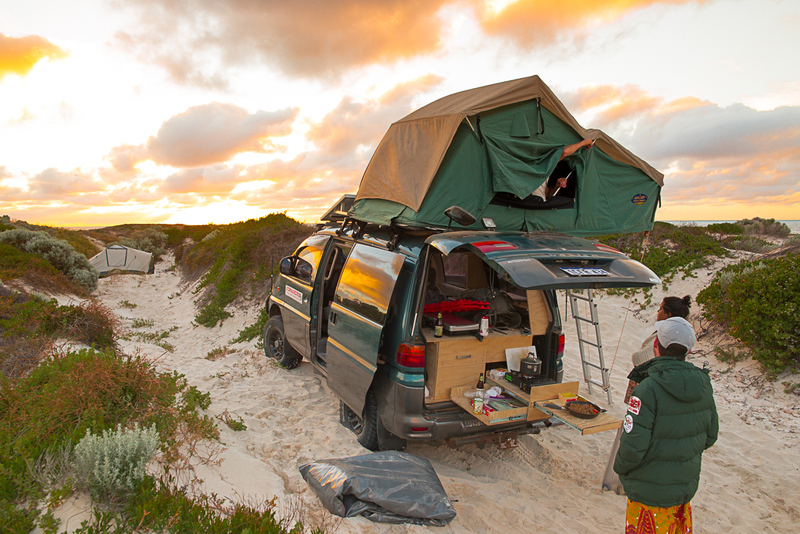 We can adjust our setup in a pinch to sleep two in the roof top tent as well as two inside the van. We have got a Marshal Premium X66HAGM as the main battery and a 120 Ah AGM deep cycle battery as our auxiliary battery. We got a single 125W unit off eBay for AUD $169 and put it on the roof. Spare tire and tool bag. We got this hot outdoor shower from Glind at the start of our trip and are so glad we did!